It’s best to let your clothes air dry but, sometimes we’re in a hurry & end up using the dryer. I know, I’m guilty of this. To compensate and ease our mind of shame, why not create something new from all the lint that was accumulated. I found this super neat tutorial on Instructables by author Ashley Amber that provides step-by-step instructions to make natural paper from dryer lint. You can then use this unique & beautiful paper for gift tags, note card or even as gift wrap. The first step is to soak the lint in warm water for at least 30 minutes. This helps the lint to break down so that it’s easier to blend during the next step. 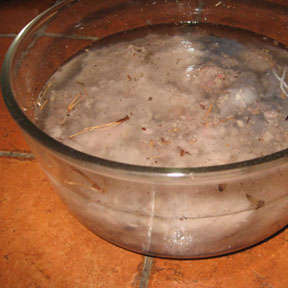 You should soak the lint in warm water until it becomes saturated and soft, the longer the better. If you have the time then soak the lint over night. You can also add other ingredients to be soaked in the water like shredded paper or leaves. Both paper and leaves will give the lint paper more body in the end. 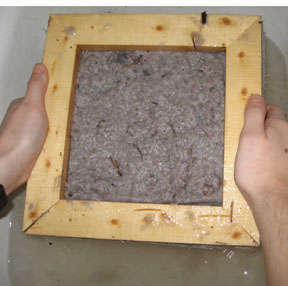 While the lint is soaking you can make the deckle and the mold, integral parts of paper making. 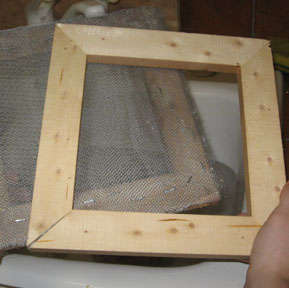 The mold is a frame with screening (like window screening) in the center that is used to catch the lint. 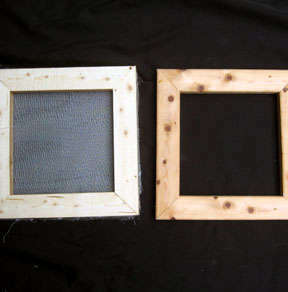 The deckle is a frame without any screening. It is placed on top of the mold and gives the paper smooth edges. Both should be the same size. The deckle and the mold are used together: the mold on the bottom (screen facing up) and the deckle on top. Make sure the screening is pulled tightly across the frame. To add the screening to the mold, use a staple gun or nails. Scoop one cup of lint and put it in the blender, then add water to fill the rest of the blender until it is close to the top. There should be more water than lint in the blender. Blend until it is smooth and mushy. After the lint is blended to a fine mush, pour it into a tub. I used my kitchen sink. You can also use baby bathtubs, large pans or buckets. Just keep in mind that the mold and the deckle will need to be able to fit in whatever you choose to use as your tub. Keep blending and pouring mush into the tub until there are a few inches of mush. Then it is time to use the deckle and the mold. Place them into the water with the mold on the bottom (screen side up) and the deckle on top. Sift the mold and the deckle in the water until enough lint has been evenly collected onto the screening. Remove the mold and the deckle from the water and let it drip for a few seconds. Then remove the deckle. Now place the mold face down onto a piece of fabric so that the lint is on the fabric. Use a sponge to press the lint onto the fabric and to soak up excess water. 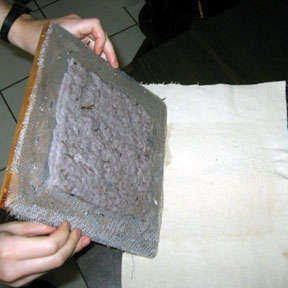 Then slowly lift the mold off of the fabric so that the lint is left. If you are making multiple pieces of paper, then place another piece of fabric on top of the lint and repeat the process. Once you are finished you can add books on top of the stack of fabric to flatten out the paper and press out the water. Once the lint is dry, you have your very own Lint Paper! Thanks again to Ashley Amber & Instructables for sharing their eco-crafts with us! Doesn’t it defeat the purpose if you use bits of paper to make paper? Toast…That’s why this paper is made from dryer lint, not bits of paper. 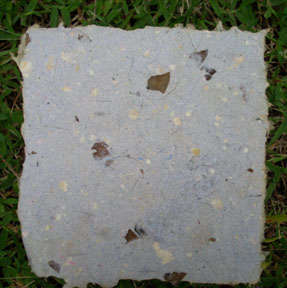 Why would anyone who is of sane mind want to do this anyway, creating paper from washing machine lint, absolute nuts. Like making your house out of mud. Get real, if saving the planet is what your about, start a war a wipe out the developing nations like China, India etc. Thats where the problem is. Paul, you must not be aware that the US is responsible for 25% of the world’s energy use. The western world uses most of the energy consumed on the planet, not the developing countries. That’s why they’re called “developing”. It’s like Gilligan’s Island in many of those places. Primitive as can be. Are you a troll? There was mention of adding paper, but this certainly doesn’t assume you are using fresh paper. Recycled paper would work just as well! Chop up some cardboard from your cereal boxes and get a bit of color in there. Funny that you should use as an example of how stupid this idea is, the oldest and world wide, the most common building material used to make houses. Adobe, which is basically a mud brick, predates any other material and is still more widely used that whatever material you might think of as being “normal”. Don’t look now, but your ignorance is showing.